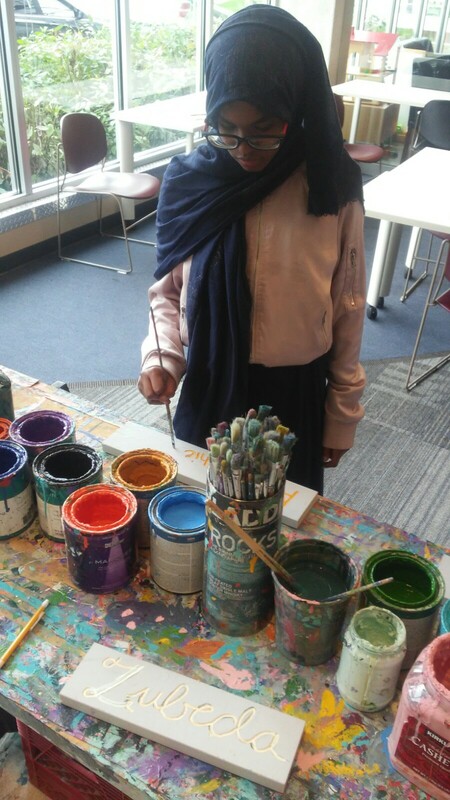 On Tuesday and Thursday afternoons, the Cedar Riverside Opportunity Center buzzes with the activities of two youth-geared programs helmed by Hennepin County Library and supported by EMERGE. 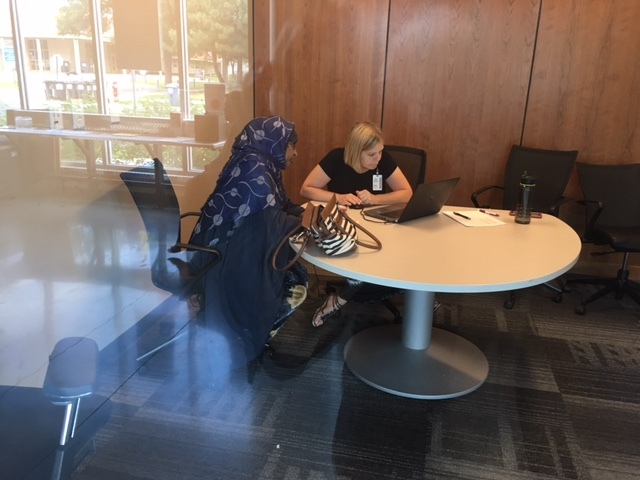 The first, homework help, is a drop-in program supported by staff Abshir Omar, library community liaison, and Sara Zettervall, community engagement librarian, along with EMERGE tutors and library volunteers. Students range in age from elementary through high school, with older students often working with each other to advance school projects. The second is the library's Teen Tech Squad program, an employment opportunity for teens in which they are supported by library staff mentors to develop research and design skills, and facilitate STEM activities for other youth. Tech Squad employees also develop interpersonal skills, enhancing their ability to work with youth of various ages from diverse cultural backgrounds. The Opportunity Center's focus on enabling education and career development for the Cedar Riverside community, including youth-directed offerings, aligns with core initiatives of the Cedar Riverside Partnership, a public private partnership committed to investing strategically in the sustainable growth and development of the Cedar Riverside neighborhood of Minneapolis. The Partnership has long invested in youth engagement in Cedar Riverside, helping to establish the Cedar Riverside Opportunity Center and supporting its mission of providing educational and workforce resources and a pipeline to good jobs. "I want to work in human resources, and at first I didn't think this job really gave me any skills in that area," said Bilan, one of four high school-age Teen Tech Squad employees at the Opportunity Center. "Since being in the Tech Squad, I've experienced working with different people and gotten to present to other teen tech squads to share projects we've worked on. I've learned to work with different kinds of people." Bilan found the job posting for the Teen Tech Squad position online. "I was looking around on the Hennepin County website and found this job opportunity. This isn't my first job - I previously worked at the Sisterhood Boutique on Riverside - and I thought the projects that Teen Tech Squad does sounded interesting, so I applied." The Teen Tech Squad helps launch student creativity and self expression. Squad members are hired for their interest in innovation and creativity, and use these interests to attempt projects such as making music, videos, and animation and employing both high- and low-tech tools, from iPads to synthesizers to sewing machines. Twice a week, Bilan and the three other Teen Tech Squad members engage students coming from homework help sessions in STEM-related skills and activities that run the gamut from 3-D printing to basic coding. "The coding was hard - we tried to direct the movements of a robot using computer coding," explained Bilan. "With younger students coming from homework help sessions, we stick with more basic projects, or help the younger students do easier versions of projects. We research and come up with ideas for all of the projects we do through Teen Tech Squad, then we share them with other youth." Bilan hears from younger students that they want to work for the Teen Tech Squad when they get older. "It's a goal for a lot of them," said Bilan. "It's like a pathway for the younger students - they go to homework help and then participate in Teen Tech Squad-led activities and think, 'I want to be doing that someday.'" Teen Tech Squad members including Zubeda, center, along with community engagement librarian Sara Zettervall, right, help younger students with the afternoon's STEM-based project, sign painting with Springboard for the Arts. 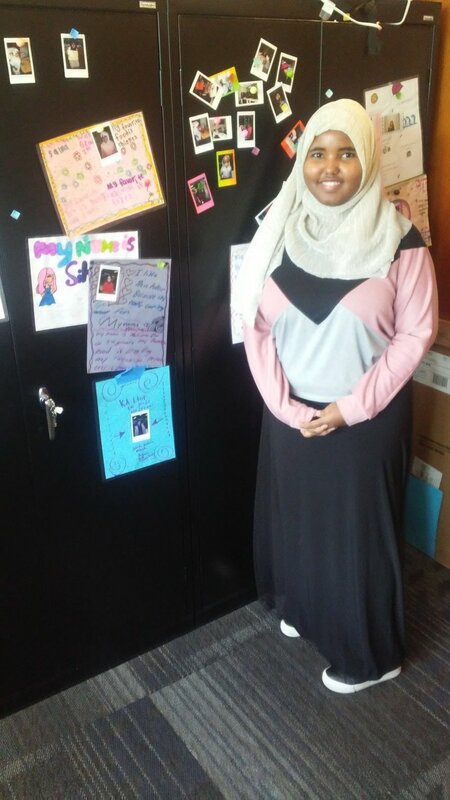 Riyana is a regular at homework help, and has built a great relationship with tutors at the Opportunity Center's Hennepin County Library homework help program. Riyana, left, works on homework, with tutor Rahma, right. Students like Riyana work closely with high school student tutors like Rahma, a student at South High School admired by the students who work with her during homework help sessions for her patience and enthusiasm for helping others learn. The library's homework help program is designed to support positive academic outcomes for youth, and supports students to complete homework assignments, boost confidence and motivation to learn, and encourage problem solving, critical thinking, basic literacy, and mathematical thinking. Homework help surveys completed by students at the Opportunity Center program show that one-on-one attention and support from tutors has been what students value most, and the reason they return to the program. Abshir Omar, the library's community liaison and someone long familiar with Cedar Riverside, helps spread the word about the library's offerings to families and others in the community. Aisha joins the Teen Tech Squad to work on sign painting led by Peter Thompson in coordination with Springboard for the Arts. "Growing up, I wasn't exposed to libraries, and much like a lot of others in this community, the older generation especially, I thought of libraries as being just for books - I didn't know all that libraries offer," explained Omar in describing his role as a library community liaison. "I let people know that the library is for everybody and help them wrap their heads around all of the offerings. You can find classes for elders, activities for youth, and homework help, as well as information on filing taxes and opening a new business." Omar pointed out that the community informs a lot of library's offerings. "The library asks the community what is needed now, which is how the homework help program was identified as a resource that the community wanted," noted Omar. "I enjoy making sure that families get the resources they are looking for. The accessibility of having a library location housed in the Opportunity Center is comforting for neighborhood residents, and if we don't offer specific resources at this site, I can refer people to nearby neighbor libraries." The homework help and Teen Tech Squad programs at the Opportunity Center align with the career pathway goals of the Center and the employers that support its work. “These youth programs at the Opportunity Center supporting academic success and early exposure to STEM pathways that are fun, interesting, and engaging are critical to building young people ready to step into health science and other tech field careers,” said Regina Pekarek, Workforce Development consultant with Fairview Health Services, an employer partner regularly present and hiring from among job seekers at the Opportunity Center. 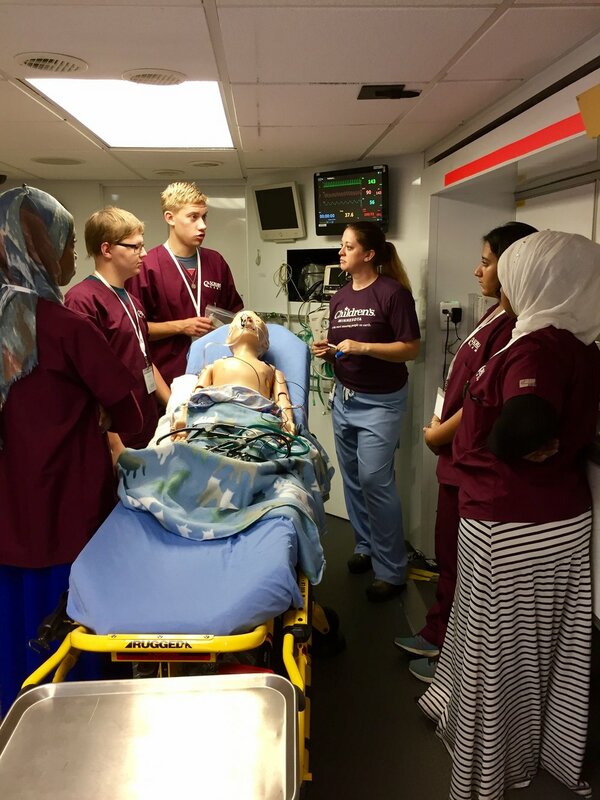 Nearly six dozen students participated in Augsburg’s Metro Scrubs Camp from July 9 - July 13. Scholarship support came from partners including the Cedar Riverside Partnership, Sherman Associates, and the University of Minnesota. Metro Transit's Gary Courtney briefs several of the 57 candidates who signed up for Metro Transit operator training at the Cedar Riverside Opportunity Center. On Wednesday, June 13, Metro Transit collaborated with the Cedar Riverside Opportunity Center to host a job fair for Cedar Riverside residents. 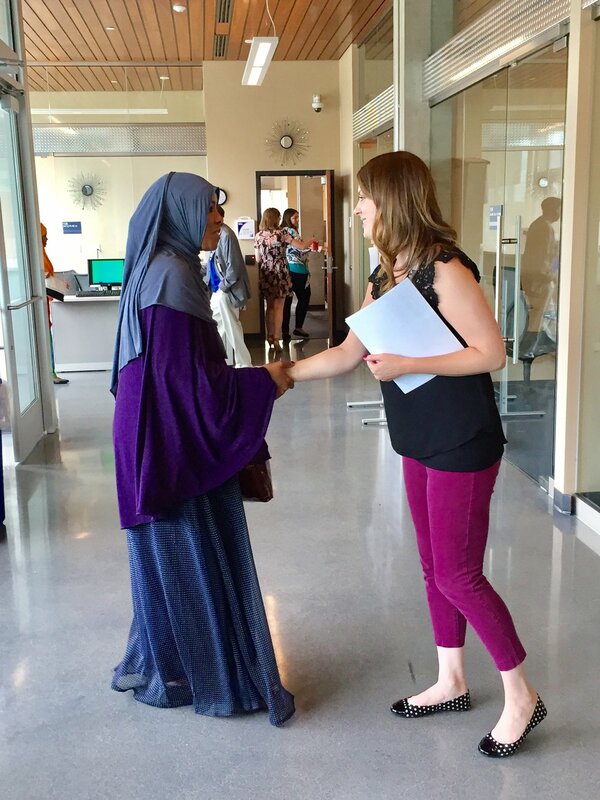 The job fair was held at the Brian Coyle Community Center in conjunction with an Iftar evening meal marking the end of Ramadan. 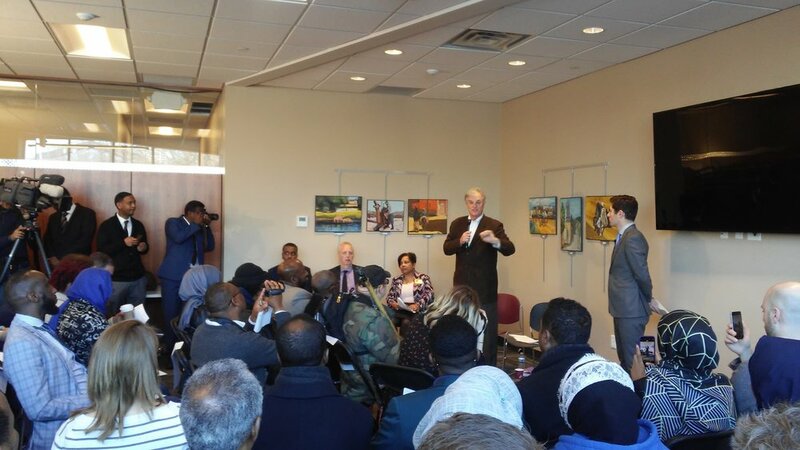 Hennepin County Commissioner Peter McLaughlin and Minneapolis City Council Member Abdi Warsame joined the 57 candidates that signed up for Metro Transit operator training and community members that came together to break the Ramadan fast. Hennepin County Commissioner Peter McLaughlin notes the power of the Opportunity Center to connect community members to livable wage jobs. "We all stand united by the immigrants that have made our region economically and culturally complete, and their achievements strengthen our communities and our region," said Commissioner McLaughlin. "For our part, it is on us to lift up our immigrant neighbors and support their success." Hennepin County Commissioner Peter McLaughlin visits with a candidate for Metro Transit operator training. Council Member Warsame and Opportunity Center Director of Workforce Mohamed Ali noted Commissioner McLaughlin's efforts to recruit robust regional employers like Metro Transit to the Opportunity Center. 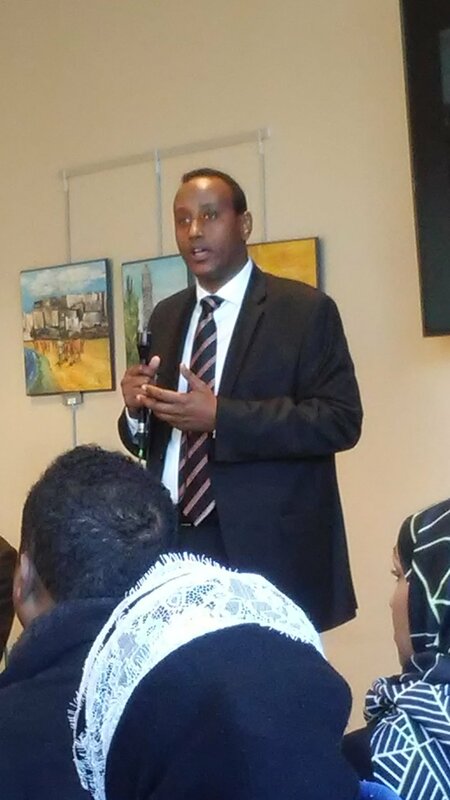 Minneapolis City Council Member Abdi Warsame reflects on the commitment of partners to the Cedar Riverside Opportunity Center. 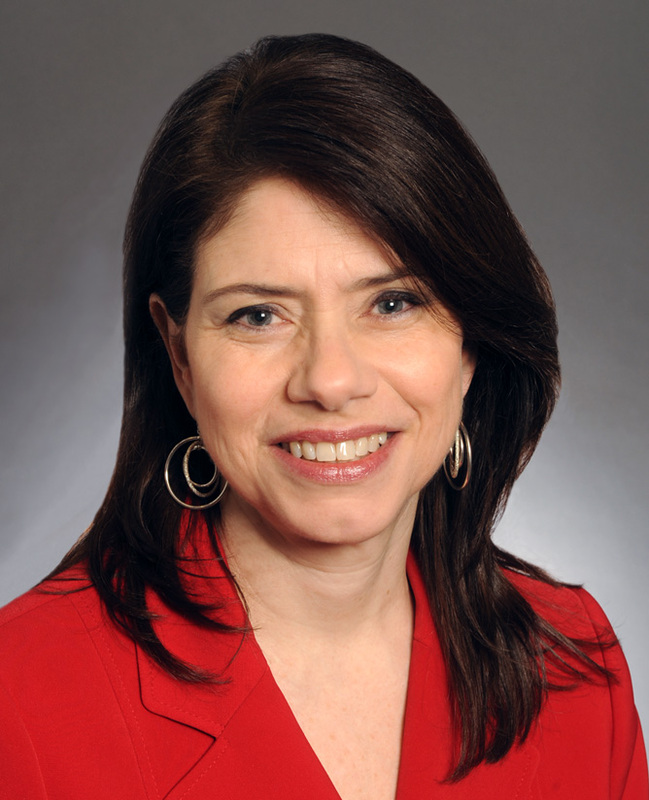 "Commissioner McLaughlin has offered courageous and constant leadership to bring equity and opportunity to all people of Minneapolis," said Ali. The 57 candidates will start a significant step toward a livable wage career when they begin Metro Transit driver training over the next three days at the Cedar Riverside Opportunity Center. Metro Transit plans to hire drivers from the candidate pool following the training, positions that pay competitive wages and provide good benefits. The Opportunity Center has supported nearly 1,000 individuals since March 2017, placing over 622 in jobs. Goals for the remainder of 2018 include increased focus on youth engagement and employment. 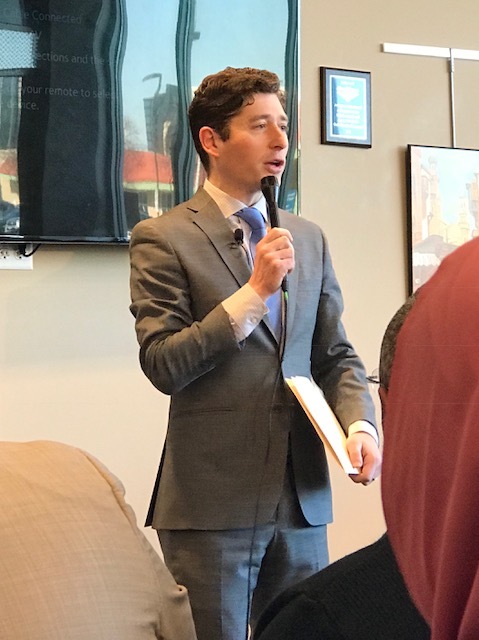 Mayor Jacob Frey welcomed a standing-room only crowd to the Cedar Riverside Opportunity Center the morning of March 12 to celebrate the Center's one-year anniversary and to hear from the leaders who brought the community workforce development hub to life. Over the past year, 321 community members have been placed in jobs through the Opportunity Center. Partners lauded progress to date, but noted also the need for continued growth during the next two years. 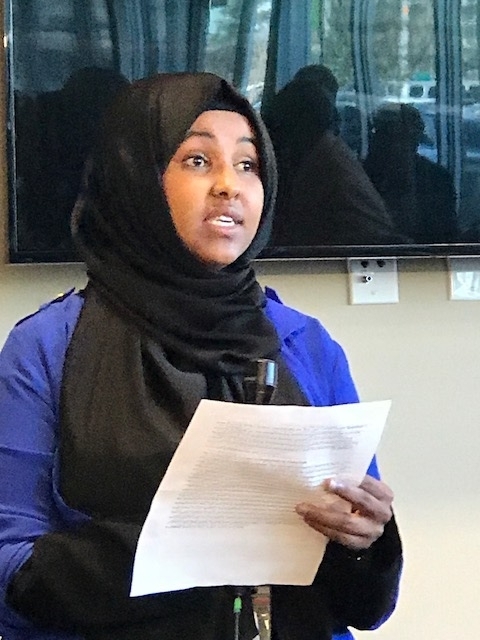 "We started working on the idea for this Opportunity Center keeping one phrase in mind," recalled Minneapolis City Council Member Abdi Warsame. "It's a saying from an African proverb -- 'proceed as if failure is not an option.'" "We have a good year behind us and a challenging two years ahead," commented Saeed Bihi, Cedar Riverside Opportunity Center Manager. "At a time when Minnesota faces a looming shortage in workforce, Cedar Riverside has the highest density of youth in Hennepin County. We are looking to partner with the city and county to harness the potential of our youth to fill this void." "EMERGE has been in the community for decades and shares the mission and vision of the city and the county for training and partnership in Cedar Riverside," said Mohamed Ali, Associate Director of the Cedar Riverside Opportunity Center. "We marked our first year of operation by serving 683 youth and adults in this space." "The community set the agenda for this Opportunity Center," noted Hennepin County Commissioner Peter McLaughlin. "The place-based focus of developing this space required special effort. Partners made a commitment to a presence at the Center every day, and to an employment strategy focused at the community level. "That's why we are right here, making it work." "MCTC knows that we need to be very active in closing the skills gap to meet employer needs," stated Minneapolis Community and Technical College President Sharon Pierce. "We are supporting the Opportunity Center by creating tailored curriculum to meet employment needs and supporting entrepreneurship development efforts." "I remember Council Member Warsame coming to my office and saying 'here is what we are going to do -- create a Cedar Riverside Opportunity Center,'" recalled Minneapolis Mayor Jacob Frey. "As late as last fall there were 73,000 job vacancies in the Metro Area. We can't leave one bit of talent on the table, and the Opportunity Center is a way to ensure that we make the best use of our local talent pool." "This Cedar Riverside Opportunity Center represents the collision of so many good things coming together in one place," said EMERGE President and CEO Mike Wynne. "We have an opportunity here to make a workforce, employment, and education engine that keeps going for a long time." The Cedar Riverside Partnership is a public private partnership committed to investing in the sustainable growth and development of the Cedar Riverside neighborhood of Minneapolis. Our Partnership presently includes Augsburg University, African Development Center, Cedar Riverside Neighborhood Revitalization Program, Fairview Health Services, Hennepin County, City of Minneapolis, Minneapolis Park and Recreation Board, Pillsbury United Communities, Sherman Associates, St. Catherine University, University of Minnesota, West Bank Business Association, and West Bank Community Coalition. 2017 saw the launch of the highly anticipated Cedar Riverside Opportunity Center, a one-stop shop for educational and workforce resources and a pipeline to good jobs for people of all ages through the committed presence of public and private sector employers. Since the opening of the Opportunity Center on March 12, the site has hosted multiple employer job fairs, workforce trainings for adults, and higher education engagement with youth. In 2017, the Cedar Riverside Opportunity Center provided services to 862 individuals. 470 youth and adults were placed in jobs, more than doubling the goal of placing 150 individuals in jobs in 2017. After 90 days, the retention rate for those placed in jobs was 79%. The Center assisted 40 participants begin short-term training programs and by December, 35 completed those programs. Five participants enrolled in a GED program and 132 enrolled in college. 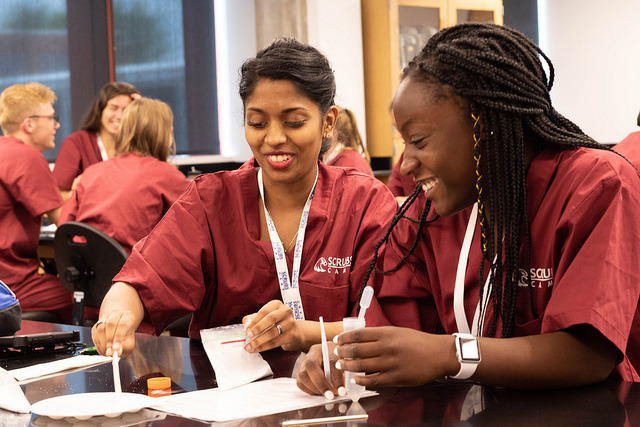 Augsburg University hosted another successful Scrubs Camp in 2017, with 71 students in attendance, 66% of whom received scholarships to attend. 60% of participants were youth of color, 46% were from low-income households, and 19% will be the first in their family to attend college. 2018 will be a year focused on securing funds for the continued successful operation of the Opportunity Center and deeper engagement with employer, educator, and community partners in connecting youth and adults to the Opportunity Center’s services. The Partnership has long focused on youth engagement and job connections for residents of the Cedar Riverside community. It has focused these efforts through specific initiatives and partnerships to connect residents to education and career opportunities. The Cedar Riverside Opportunity Center opened in March 2017 with the goal of reducing unemployment and increasing higher educational attainment and enrollment within the Cedar Riverside neighborhood. The Center serves as a one-stop shop for educational and workforce resources and a pipeline to good jobs for people of all ages through the committed presence of public and private sector employers. Funders Pohlad Family Foundation, McKnight Foundation, Otto Bremer Trust, Minneapolis Foundation, Pat and Tom Grossman Fund of the Minnesota Community Foundation, Mortenson Foundation, Hennepin County, and the City of Minneapolis joined to support the key goals of reducing the neighborhood’s unemployment rate and increasing access to educational programs. Partners will continue to expand and fundraise for the Opportunity Center in 2018. 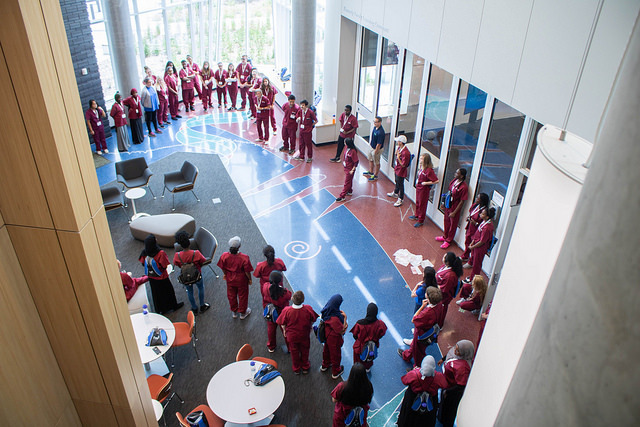 Scrubs Camps, held annually each summer at Augsburg University, introduces high school students to a vision of college and health care careers. The majority of participants are low-income students of color. In 2017, partners Fairview, St. Kate’s, Augsburg, Sherman Associates, and the University of Minnesota were actively involved in supporting the camp. The immersive camp includes a week of hands-on sessions with professionals on a college campus. After the camp, 93% of participants said that the camp helped them focus their future career goals and 83% said that spending time on a college campus helped them to visualize themselves at college. 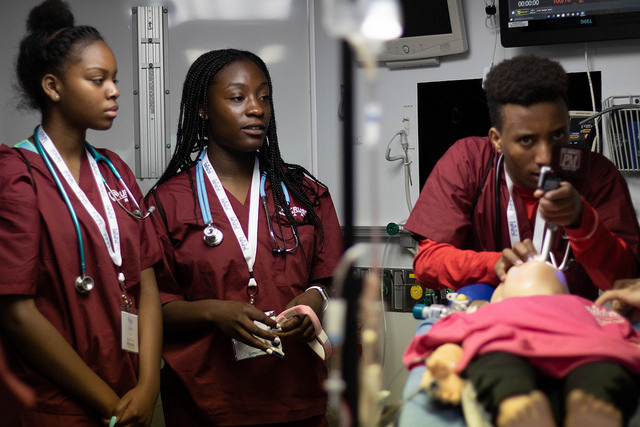 92% said that Scrubs Camp made them think more seriously about going to college and 97% responded that after attending the camp they could see themselves in the health care industry. Partners supported the Youth Collaborative by providing funds to enable the collaborative to hire a professional youth worker in the community to identify issues and action steps. The individual hired will work to re-invigorate youth connections in the community in 2018. Partners supported another successful national night out at Riverside Plaza. The Cedar Riverside Safety Center led the event, offering balloons, face painting, ice cream, yard games, and prizes. The Minneapolis Fire Department and Minneapolis Police Department met community members throughout the day. After a violent crime was committed in the Cedar Riverside Neighborhood in early 2017, the Partnership sought to provide a statement reflecting the impact the crime had on the community as a whole. The Partnership followed the legal proceedings and submitted a Community Impact Statement to the Hennepin County Attorney’s Office reflecting the Partnership’s fundamental goal of ensuring safety within the Cedar Riverside Community. The Cedar-Riverside community came together on a sunny Tuesday afternoon to celebrate National Night Out on the first of August. Children with colorful balloons lined up for face painting and free ice cream. They also played yard games to receive tickets to trade in for bubbles, whistles, books, and various school supplies. The Minneapolis Fire Department stopped by to show kids the inside of their fire truck and tickets for rides at Mall of America’s Nickelodeon Universe were handed out to the adults. 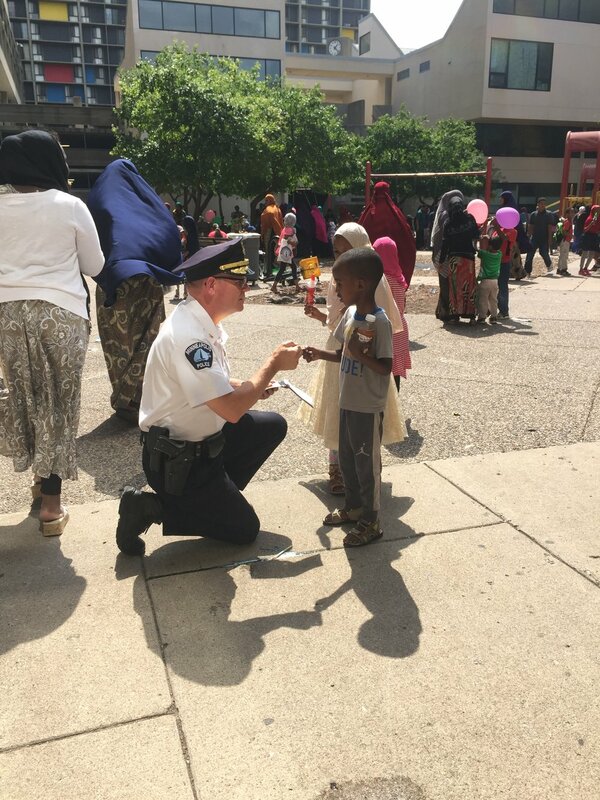 Community Action Partnership of Hennepin County, Pillsbury United Communities, Hennepin County Attorney’s Office, and Hennepin County Sheriff’s Office were present to hand out information, wristbands, tattoos, and more. 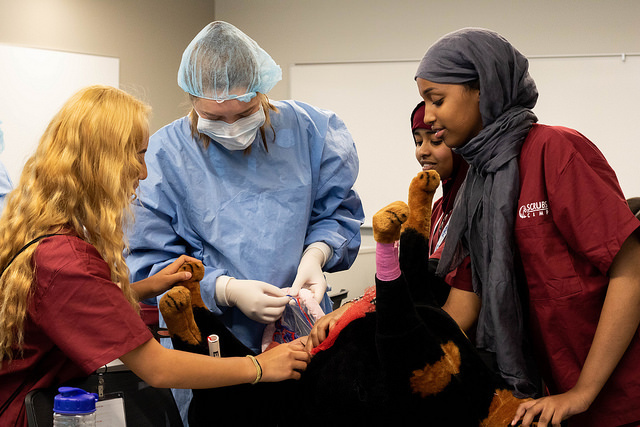 The eighth annual Augsburg Scrubs Camp enjoyed another summer of strong student participation and sparked interest in health care careers. 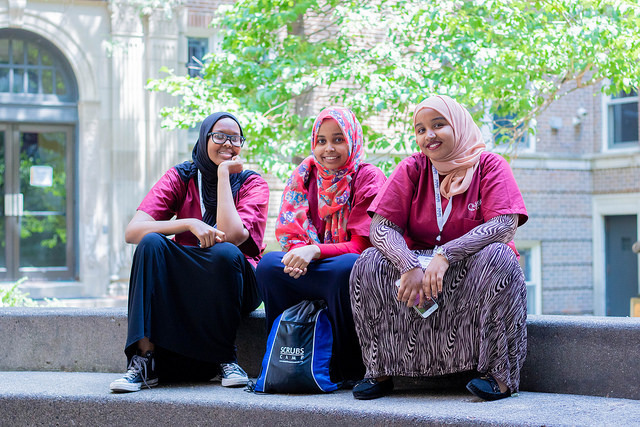 Scrubs Camp is a summer youth camp provided by HealthForce Minnesota that works to connect high school students from underserved populations to visions of college and careers in healthcare. 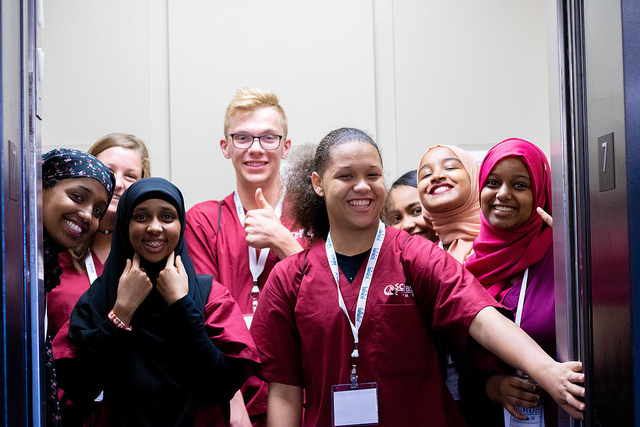 The camp introduces career pathways in healthcare by engaging students in hands-on sessions taught by camp sponsors such as University of Minnesota and Fairview Health Services, and introduces participants to health care professionals. 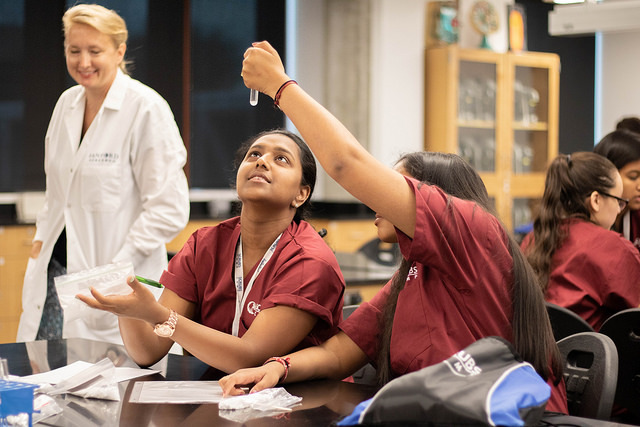 Scrubs Camp provides students with access to college labs, classrooms, and facilities, providing students the opportunity to tour a college campus and explore higher education. 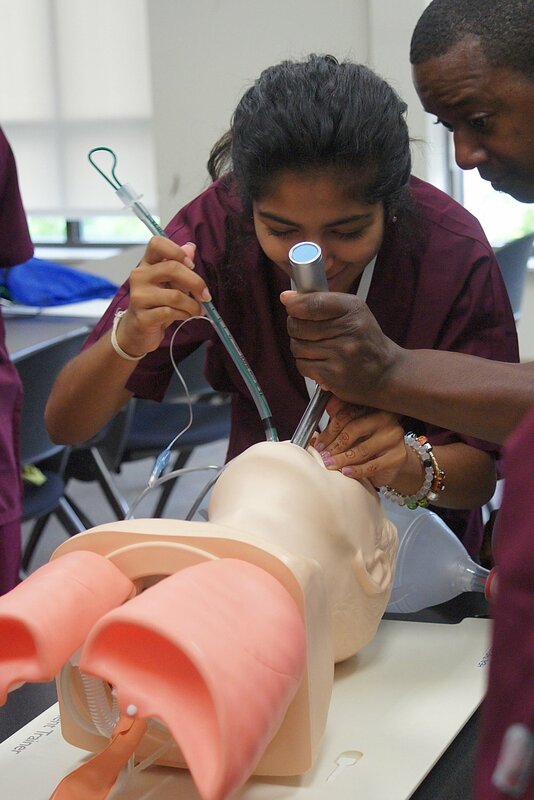 Connecting students of color to pathways to higher education and careers in healthcare is important to the Cedar Riverside Partnership. 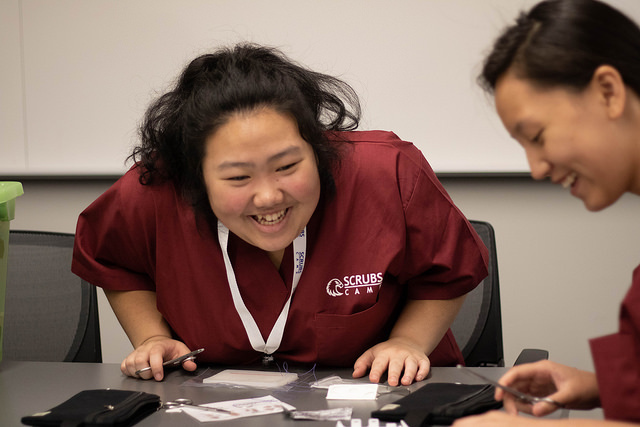 In 2016, participants at the Augsburg Scrubs Camp were 38% African-American, 23% Asian/Pacific Islander, 20% Caucasian, 14% Hispanic/Latino, 3% mixed race/ethnicity, and 1% other. Augsburg's Scrubs Camp is the second-oldest in Minnesota. 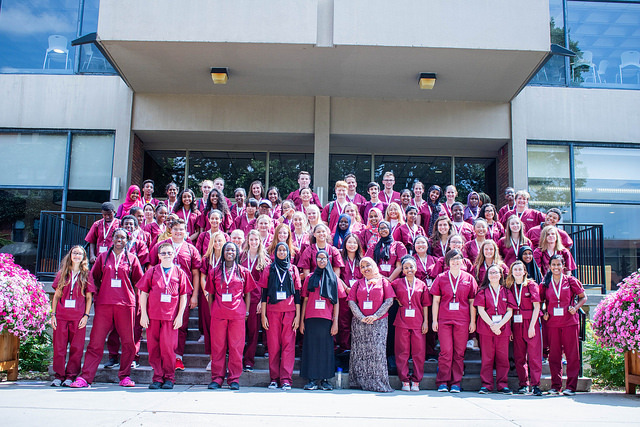 This year, approximately 80 students registered for Scrubs Camp at Augsburg. The high school students gathered in Foss Chapel for an opening ceremony. Counselors introduced themselves and students shared the high schools that they attend. Some noted that they were interested in dermatology, others in phlebotomy, and some unsure of what they might want to pursue in health care. 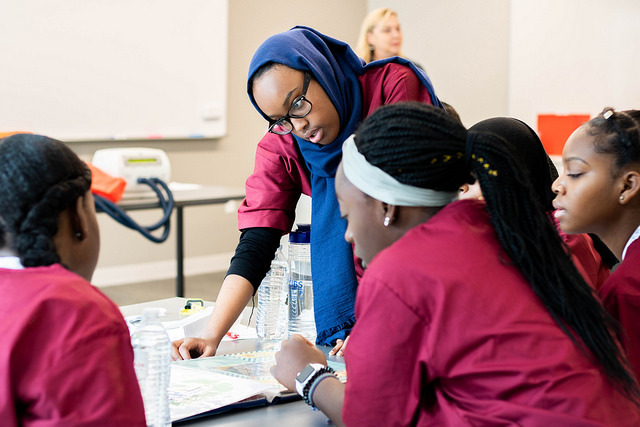 The first four blocks of Scrubs Camp included About Asthma, Biomedical Engineering, Pharmacy Careers, and What is an Anesthetist? Groups of approximately 20 high school students rotated throughout the day between each block. Milt Green, Certified Registered Nurse Anesthetist (CRNA) at Regions Hospital, gave a short presentation about becoming an anesthetist before allowing the students to ask him questions about his career. Green encouraged the students to come and shadow him at Regions Hospital after graduation. “You never know until you see the profession yourself,” said Green. When asked about his favorite part, Green said that he enjoys work with trauma patients. 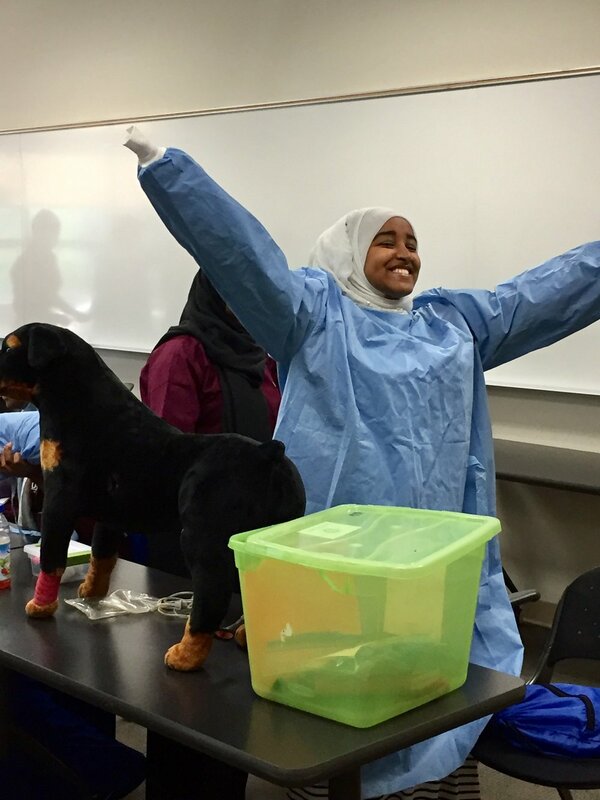 After the presentation, students experienced putting a patient under anesthesia using mannequins and medical tools. Scott Bosch, Manager of Clinical Engineering Services and Medical Technology at Park Nicollet Health Services, and Rodney Nolen, Manager of Biomedical Engineering at Fairview Health Services, talked to the students about biomedical engineering and allied health careers. “Not everybody needs a four-year degree to work in a hospital,” said Bosch. Shannon Greely, Recruiting Coordinator at the University of Minnesota College of Pharmacy, talked to the students about the timeline for pharmacy school and what to expect in a pharmacy career. Students also completed a hands-on compounding activity using Vanicream, cornstarch, and glycerin to create a custom medication. Jenny Kelley, Clinical Care Supervisor and Asthma Program Coordinator at Hennepin County Medical Center, presented information about the significance of asthma and pursuing a career around asthma. On day two of camp, students got the chance to try their hand at pediatric care. 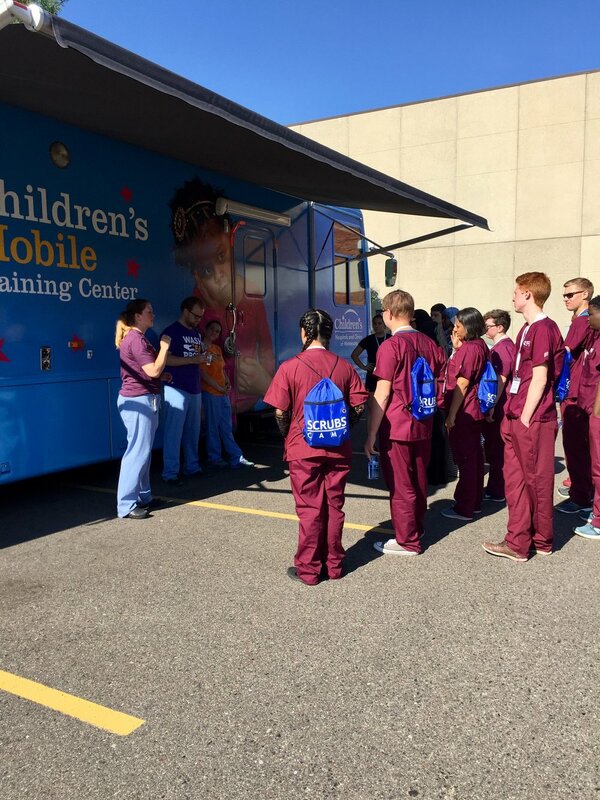 Children’s hospital was on-site with their training simulation van. The advanced equipment offered students the opportunity to train like practicing healthcare professionals. “Our doctors use this van to practice their skills, so they can deliver the best patient care possible,” said the pediatric nurse. 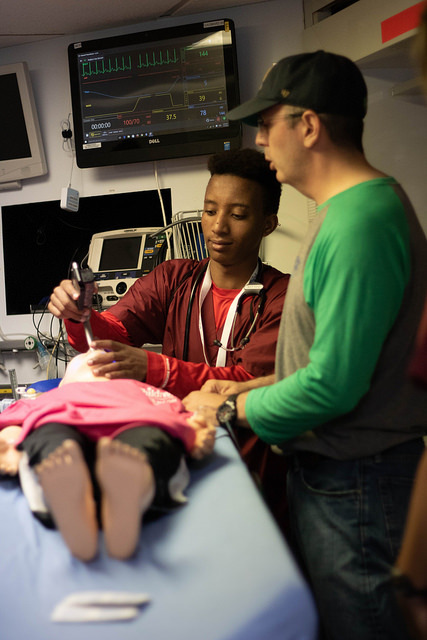 The simulation van was equipped with a state-of-the-art mock emergency room and technology that allowed the students to monitor the neurological and physiological symptoms of their four-year-old “patient". The campers took turns checking for breathing and offering diagnoses. 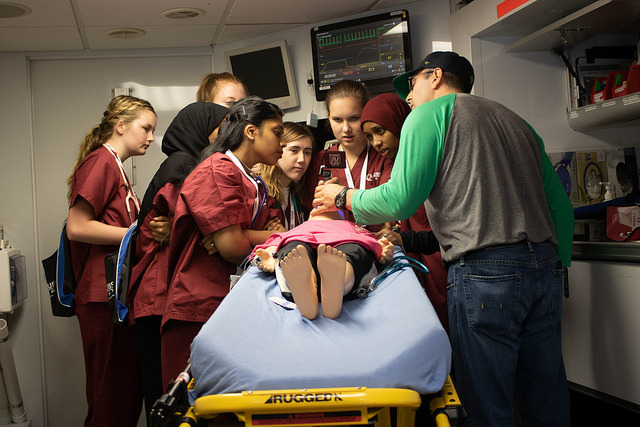 After diagnosing their patient with pneumonia and trouble breathing, the students got to administer a sedative and paralytic, and even inserted a breathing tube. 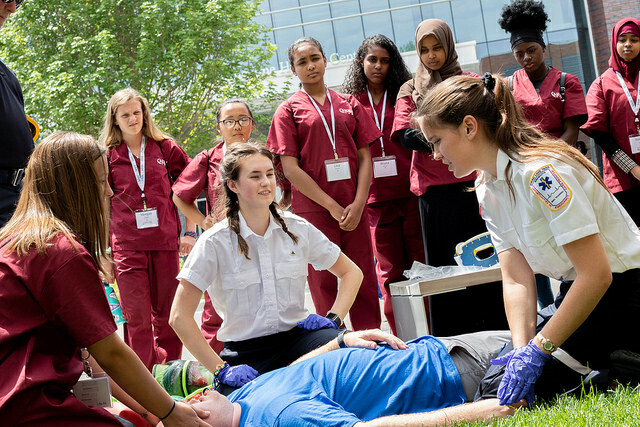 The mission of Scrubs Camp is to foster a pathway to careers in health care by educating students and exposing them to the variety of careers available in the field. 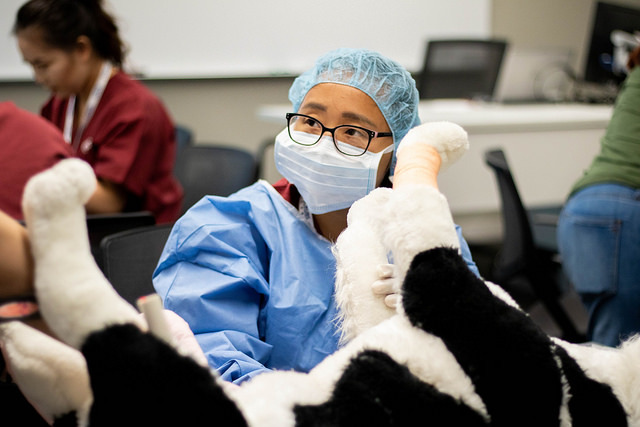 The diverse blocks offered at the camp ensure that there is “something for everyone.” Three third-year students from the University of Minnesota College of Veterinary Medicine taught the campers about providing medical care to animals. First, the volunteers gave the students a brief overview about the differences between caring for humans and animals. After the overview, it was time to put what they had learned into practice. 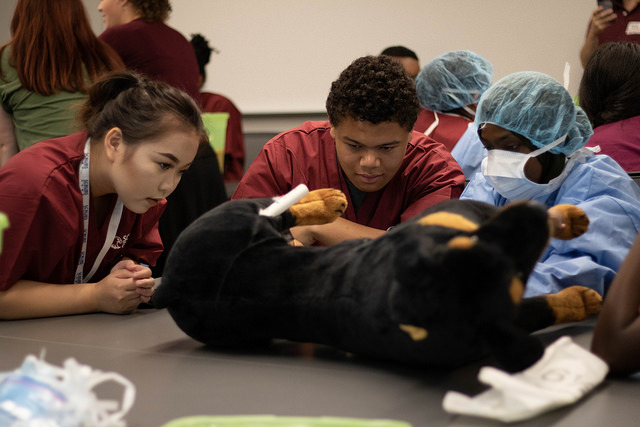 Plush dogs equipped with mock internal organs served as the “patients.” After assessing their patients, the students determined the animals needed surgical care. They had to “scrub in” for surgery and maintain a sterile environment to provide proper patient care. 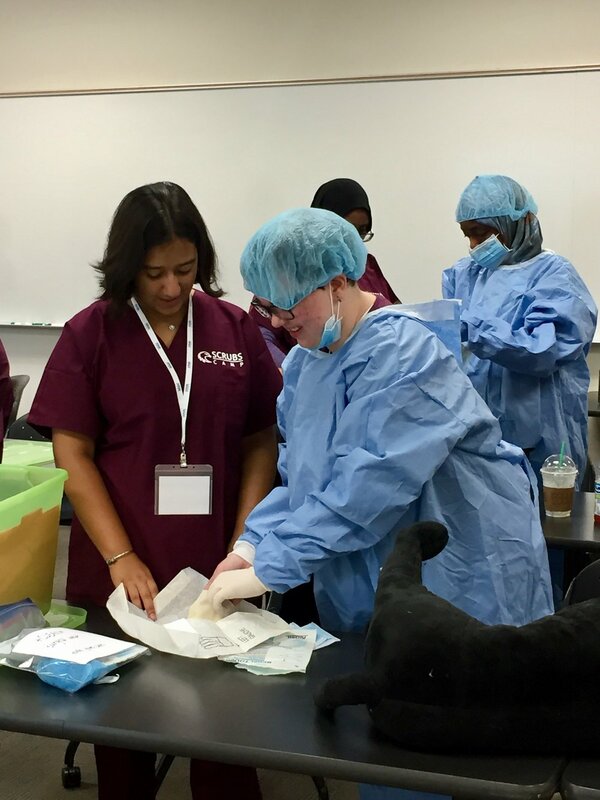 As students worked in teams to save patients’ lives, they learned about the collaboration, attention to detail, and time management that is necessary in veterinary surgical operations. 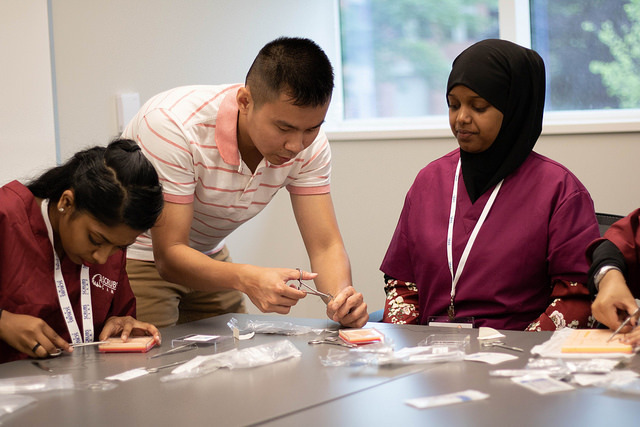 On the third day of Scrubs Camp, participants took part in blocks about medical equipment applications, geriatric care, and sports medicine and rehabilitation. One of the most fun activites of the camp took place in the geriatric care block, with the use of age suits. Winona State nursing student Emily Jansen led the session, introducing participants to the concept of geriatric care. Students were invited to try on age suits, which were composed of several different aspects. Clouded glasses simulated cataracts, while gloves simulated a loss of touch and struggle with fine motor skills. Neck braces introduced students to lack of mobility, while full-body suits with straps and rods simulated arthritis, hunched backs, and difficulty bending and moving. Students got to experience all these effects of aging before debriefing together. President Paul Pribbenow of Augsburg College gave the main address of the Closing Ceremony, dressed in full academic regalia. He spoke about his love of Scrubs Camp, and the importance of the program, especially with the growing need for nurses. President Pribbenow presented each participant with a diploma, congratulating them on their successful completion of the program. Family and friends looked on as each participant celebrated their successful experience and got a taste of what a college graduation would feel like. Scholarships for many Scrubs Camp participants come from Sherman Associates and others. One great sign of early success for the Cedar Riverside Opportunity Center is the engagement and active presence of more than a dozen employers. Augsburg College, Fairview Health Services, Hennepin County Medical Center, Medtronic, Metro Transit, the Minneapolis-Saint Paul International Airport, and People's Center Health Services are among the employers who have committed to a regular presence at the Center. Unemployment is a serious problem in the Cedar Riverside neighborhood. Statistics from the Minnesota Department of Employment and Economic Development indicate unemployment is sitting at 3.7% across the state of Minnesota, but has been nearly 18% in Cedar Riverside. The Opportunity Center works to address this disparity by partnering with local employers able to offer the entry-level employment many residents need. Employers’ motivations for engagement at the Opportunity Center vary, but all include a commitment to fostering pathways to employment. “Fairview believes we should invest in the community we serve and our workforce should represent the communities we serve,” noted Regina Pekarek, a Workforce Development Consultant for Fairview Health Services. To date, Fairview has hired eight candidates from the Opportunity Center. Good business sense also encourages partner engagement and hiring at the Opportunity Center. Pekarek is one of the employer partners that find convenience to be fundamental to the success of the Opportunity Center. Fairview especially appreciates that the employment center is located mere blocks Fairview’s largest hospital, providing a streamlined process for filling the 600-plus job openings Fairview is looking to hire for weekly. Employers have found committed job seekers at the Opportunity Center. “They are ready to work and they possess the values of loyalty and commitment; they are committed to doing a job well, and they have an enthusiasm to gain employment,” noted Pekarek. EMERGE Community Development facilitates job seeker preparedness by ensuring that by the time the employers arrive on-site, applicants are prepared. “Emerge has a strong vetting process where they meet with residents prior to employer interview dates and help residents look over their applications, prepare residents to communicate with employers, and even help with employer onboarding processes,” Pekarek explained. The Cedar Riverside residents and others who come to the Opportunity Center provide partner employers access to a diverse pool of applicants. Pekarek noted that this diversity offers a way for public and private organizations to ensure a workforce that reflects the larger community. “The population is shifting, and we can learn from this community and they can learn from us,” Pekarek noted. Fairview has discussed the option of utilizing customized training where individuals would be trained at the Opportunity Center and placed directly into entry-level positions with Fairview in the future. Fairview is eager to spread the word and bring more employers to recruit at the Center. “News of the Opportunity Center will spread by getting the word out through success stories and through opening doors for other employers to come and observe the inner workings of the Center,” commented Pekarek. There will likely by more opportunities for the Center’s growth once good data about hiring and job retention is available. Current partner employers do indeed span several sectors. Public, private, medical, transportation, and education employers have all recognized the benefit this partnership could provide to their organizations, the residents of Cedar Riverside, and the communities that they serve. Three months after its grand opening, the Cedar Riverside Opportunity Center is blooming. The Center has already welcomed over a thousand visitors. Over four hundred individuals have completed a formal intake process; 34 have already found employment; and 12 have enrolled at MCTC. Fifteen employers, including Fairview and Hennepin County, are now engaged in recruiting from the Center. While there are many factors contributing to this intense interest, one key factor is the Center’s location and physical design. Across from the Brian Coyle Center in the heart of Cedar Riverside, the Center’s street level presence and open glass architecture reflect strong design intention. 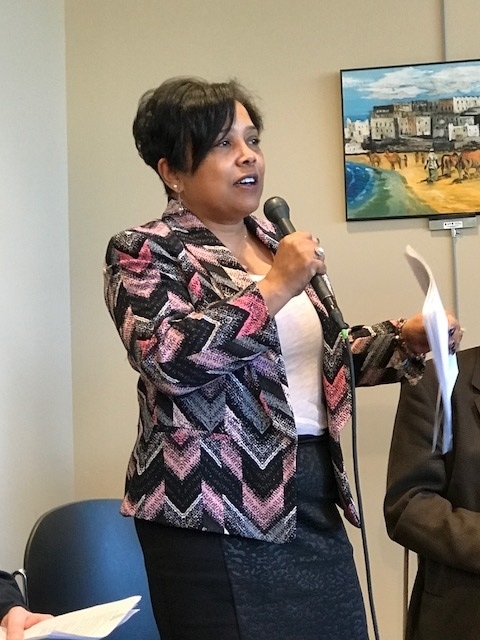 Community voices, including East African elders, urged that the Center be a welcoming and transparent space for the Cedar Riverside community. The Opportunity Center offers the surrounding community a space to connect residents to employment opportunities and educational resources, presenting a new model for workforce centers. Mohamed Ali, Associate Director of the Center and Program Manager at EMERGE, and Kevin Busch, Architect of the Center and owner of Busch Architects, Inc., sat down to discuss the development and physical design elements of the Center. 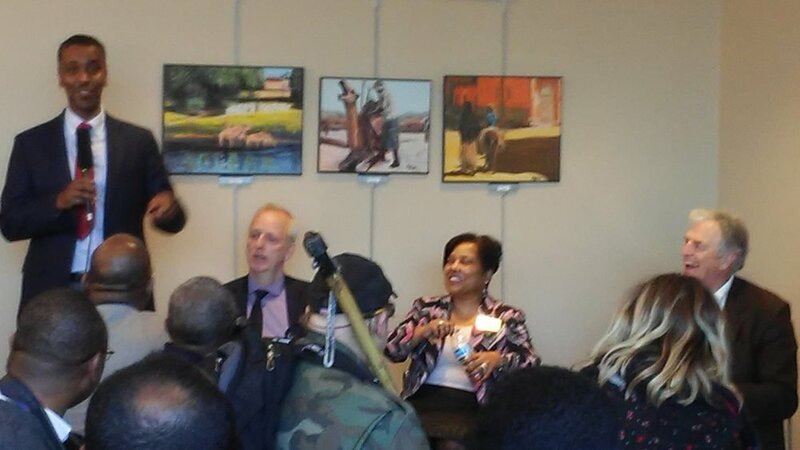 The Cedar Riverside Partnership started a conversation about an opportunity center to integrate employment, education, and library resources in a new and accessible way that is open to all in Cedar Riverside but with a special focus on East African youth and young adults. After studying several potential locations, the new construction at 515 Fifteenth Avenue South presented an opportunity to design and build the center in a great new location. “EMERGE has a long history in Cedar Riverside,” explained Ali. “We were very pleased to be invited as one of the anchor partners.” The Cedar Riverside Partnership then led a successful fundraising campaign with key funding commitments from the McKnight Foundation, Pohlad Family Foundation, Otto Bremer Trust, Minneapolis Foundation, Pat and Tom Grossman Fund of the Minnesota Community Foundation, Mortenson Foundation, Hennepin County, and the City of Minneapolis. Busch’s small business enterprise, located in downtown Minneapolis, won the project through the Hennepin County selection process. Busch Architects, Inc., started working on the design in June 2016. “Hennepin County kept everything organized and we began to meet with Mohamed, others from the county, EMERGE and MCTC,” said Busch. Busch and his team developed a schematic design by the end of July and started construction drawings in September and in October, project contractor Jaeger Construction was hired. One of the most unique design elements of the Center is the addition of foot washing stations in two of the bathrooms. Community members use the stations in preparation for prayer. Following discussion over which kind of faucet to use, the Center ended up selecting a simple faucet accessible for users of all ages. “You can't find these in other public spaces, other than mosques,” Ali stated. “We also have a prayer room that operates as a mother’s room,” Busch continued. Ali pointed out that it’s the only space in the whole neighborhood where community members have that kind of privacy, other than their own home. The designers wanted to imbue the space with a high-tech feel. This is evidenced by the laptops that are available to use anytime, the workstation where people can plug in their devices and get connected, and password-free Wi-Fi provided by Hennepin County. “There’s going to be an 8-foot screen here in the community room and screens in each interview room that people can use for training, recruiting, and other things,” Busch explained. There are also plans to install a television screen that community members will see when they walk in the door. The screen will present the daily and weekly activities happening at the Center. Busch explained that one of the other design concepts is to think of the Center as an oasis; the idea that people could come here to fulfill many needs. “You’ve got college, employment, library, and other service information - all of that in one building is very unique,” Ali added. Looking forward, one of the biggest challenges facing the Center is parking. “It’s hard for people who just want to stop in quickly,” Ali said. Fortunately, the location is conveniently accessible from the light rail for both the Blue and Green Line. The Cedar Riverside community has come together to embrace the Opportunity Center. “The most exciting thing for me was how many people got behind the project, from the county, politicians, community, and everyone who was just excited about getting this going and making this work,” Busch said. 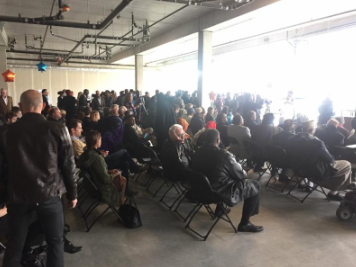 Hundreds of Cedar Riverside residents and community leaders braved 20 degree temps and snow flurries on Sunday, March 12 to celebrate the grand opening of the Cedar Riverside Opportunity Center. Minneapolis City Council Member Abdi Warsame welcomed the crowd to the outdoor program. He praised the years of collaboration among many partners sharing a vision for the Opportunity Center that led up to the grand opening day. "So much hard work, the vision of our elders, and the dreams of our youth have led us to create one of the most beautiful places in our neighborhood," Warsame said. Council Member Warsame noted that two of the rooms in the Center had been named for elders Adam Jilo and Ahmed Keynan. Noting that "we are living in a difficult moment of U.S. history," Hennepin County Commissioner Peter McLaughlin observed that all of us can make choices. "Here in Minneapolis, here in Hennepin County, we are choosing with our better angels to welcome immigrants," Commissioner McLaughlin declared. "We are choosing to open the doors into our economy for the next generation of Americans." 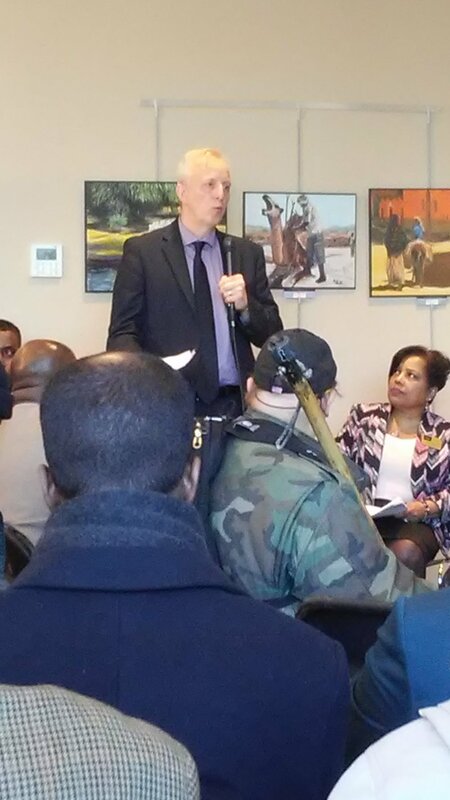 Augsburg College President Paul Pribbenow, Chair of the Cedar Riverside Partnership, congratulated Council Member Warsame and Commissioner McLaughlin for their inspirational partnership as the leading advocates for the Opportunity Center. He recalled that the Cedar Riverside Partnership initiated the vision for the Center in November of 2014. President Pribbenow traced two and a half years of work of many community members, private sector partners, and government entities that came together to realize this vision. Mohamed Ali, of EMERGE and Associate Director of the Opportunity Center, thanked the community and all of the partners who helped bring the Center into existence and who remain invested its ongoing work. He reported that eleven employers are already scheduled to conduct recruiting interviews at the Center. Hundreds of community members attended the October 2016 community celebration groundbreaking event. Join the grand opening community celebration for the Cedar Riverside Opportunity Center. The Center will be a one-stop shop for educational and workforce resources and a pipeline for job opportunities. Employers with a robust recruiting presence at the center will include Hennepin County, Fairview Health Services, Hennepin County Medical Center, City of Minneapolis, University of Minnesota, Augsburg College and St. Catherine University. The Star Tribune discusses the development of the Cedar Riverside Opportunity Center and the positive impact on the Somali Community. Please join in a community celebration to mark the groundbreaking of the Cedar Riverside Opportunity Center – a one-stop shop for educational and workforce resources and a pipeline for job opportunities that will open spring 2017. The celebration will serve as an open house for people interested in learning more about the center with elected officials and community leaders scheduled to speak. 515 on the Park, 515 15th Ave. S.
Hundreds of Cedar Riverside residents turned out to celebrate the groundbreaking of the new Cedar Riverside Opportunity Center. Council Member Abdi Warsame served as Master of Ceremonies and welcomed everyone in English and Somali. Members of the Cedar Riverside Partnership praised the community collaboration in creating the vision of this Center, and the hard work to make this vision a reality. Partners recalled the years of collaboration that led up to the momentous Groundbreaking. Council Member Warsame spoke in English and Somali about the community vision behind the Opportunity Center and the commitment that helped turn the vision into a reality. “For two and a half years, we have been dreaming and working on this project," said Council Member Abdi Warsame. “This Opportunity Center is part of the story of how our City is changing," noted Hennepin County Commissioner Peter McLaughlin. Mayor Betsy Hodges spoke about Minneapolis' long-time support for the Opportunity Center. State Senator Kari Dziedzic applauded the focus on education in the planning that took place for the Opportunity Center. Augsburg President and Cedar Riverside Partnership Chair Paul Pribbenow introduced the role of the Cedar Riverside Partnership, which came together to explore ways to leverage their collectively significant assets in Cedar Riverside. EMERGE President Mike Wynne and Associate Director Mohamed Ali noted the impact that the Opportunity Center will have in Cedar Riverside. “MCTC shares so much in common with Cedar Riverside," reflected MCTC President Sharon Pierce. "We are proud of our diversity, and we are committed to creating opportunities for everyone by improving access to the transformative power of education." Cedar Riverside resident Ahmed Mohamed says that it all started with his mother. She saw an ad at the Brian Coyle Center about IT Ready, and pushed her son to consider the program, created by EMERGE to connect unemployed and under-employed youth and young people from underserved populations to careers in IT. Mohamed was working at an employee travel agency as an on-call reservation specialist when he applied to IT Ready. Computers and computer networking came easily to him, but he did not pass his first certification test. Discouraged but not defeated,Mohamed said that his family supported him during the certification testing and re-testing. “It’s all about what motivates you,” said Mohamed. “For me, that’s my family." Fairview is one of the anchor employer partners in the new Cedar Riverside Opportunity Center, an initiative of the Cedar Riverside Partnership that will be led by Hennepin County and managed by EMERGE. The County just signed the lease for the new Center at the Five15 on the Park building across from the Brian Coyle Center. Construction is expected to begin this Fall, and the Center should be ready to open early in 2017. IT Ready trains students for nearly 300 hours over eight weeks to help them master the technical skills necessary to obtain professional CompTIA A+ IT certification. The program also nurtures the soft skills its students must develop to succeed in interviews and thrive in their future workplace. Over the last four years, IT Ready has been extremely successful in its goal of placing students in relevant, local, paid positions. According to Creating IT Futures, four out of five IT Ready students find IT jobs with local companies. Mohamed credits the team atmosphere at IT Ready for preparing him to become a team player on the Fairview IT team. At Fairview, he constantly asks himself, “How can I make the team better?” He learned that approach at IT Ready. Mohamed has already helped several young people apply for and enroll in IT Ready. He offered a reference for one Augsburg College graduate from Cedar Riverside who applied for an IT position at Fairview, and Fairview made the hire. When Mohamed began his job at Fairview Health Services, he instantly began growing his professional network. “I feel like I have another family outside of my family when I am here,” he said of working at Fairview. “I know Fairview is in my best interest.” Thanks to mentors like Lori Offerman, a consultant for the Fairview IT Workforce Strategy, he is excited to advance his career. Supported by the resources IT Ready helped to align, Mohamed personifies his mantra “you get out of it what you put in.” Mohamed hopes to become a project manager in the future, and no one doubts that he will achieve this next goal. Construction of the Opportunity Center is expected to begin this Fall, and the Center should be ready to open early in 2017. Read more about the Opportunity Center on our website. Shawntera Hardy, MN Commissioner of Employment and Economic Development, toured the future site of the Opportunity Center on October 4 with Senator Kari Dziedzic, Hennepin County Commissioner Peter McLaughlin, Minneapolis Council Member Abdi Warsame, Laura Beeth, Fairview System Director of Talent Acquisition, Dr. Sylvia Bartley, Medtronic Philanthropy Program Director, Mike Wynne, President, EMERGE, and Louis Smith, Counsel to Cedar Riverside Partners hip. Read more about our workforce initiatives on our website. Augsburg College hosted another successful Scrubs Camp from July 11-15. 69 students attended the Augsburg camp, 10 of whom were residents of the Cedar Riverside neighborhood. 51 students attended the camp on scholarships, 90% of whom attended on diversity scholarships. 75% of participants were female, 38% African American, 23% Asian or Pacific Islander, 14% Hispanic, and 3% mixed race. 35% of participants were from Minneapolis. "I am more driven to pursue a career in health, I've learned I really love health care!" "This camp has made a huge impact in my life because looking at all the different health care fields is making me think about my future." "At first I was skeptical about coming, but now I really want to be in health care." 100% of participants said that the camp sessions helped them learn, 98% said that Scrubs Camp helped them focus on their career goals, 97% said that Scrubs camp helped them think more seriously about going to college, and 95% said that they could see themselves in the healthcare industry after Scrubs Camp. Participants unanimously gave the overall camp experience 100%. Partners who assisted with the camps, sponsored students, or attended the closing ceremony were impressed by the great feedback from energized participants, and the ease with which the camp unfolded. Partners are interested in exploring ways to expand the number of participants from Cedar Riverside for the 2017 camp. Read more about Scrubs Camp on our website. The Cedar Riverside Safety Center hosted a widely attended National Night Out Celebration on August 2. “We had great participation from everyone," said Carla Nielson of the Safety Center. "Residents, staff from Sherman Associates, and police were all working together to make it a wonderful event." Read more about the Safety Center and CRP safety initiatives on our website. Following the Pohlad Family Foundation’s $100,000 commitment to the Opportunity Center announced August 10, the McKnight commitment brings the total funds raised to $950,000, the sum required in capital funds to build the Opportunity Center. Other confirmed funders include the Otto Bremer Foundation ($150,000), Hennepin County ($250,000), the City of Minneapolis ($100,000), and the Minneapolis Foundation ($75,000). The news of these funding commitments came just in time for Hennepin County to meet a September 9 deadline to sign the ten-year lease for the first floor mixed-use space of the Five15 on the Park building across from the Brian Coyle Center. 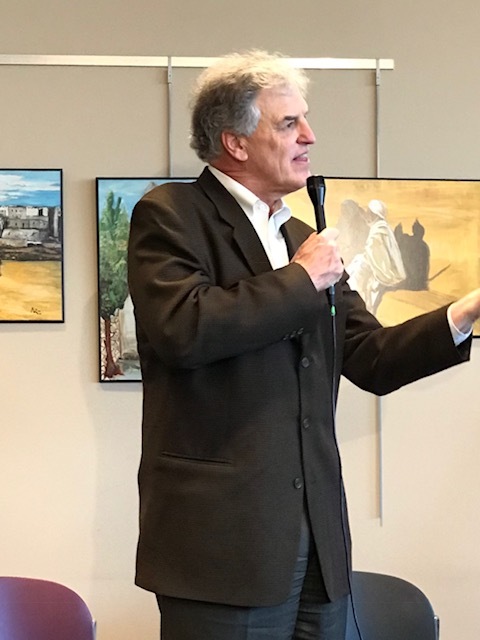 Hennepin County Commissioner Peter McLaughlin praised the collective community response following the County’s initial commitment of $250,000 to the Center. Commissioner McLaughlin also praised the leadership of Minneapolis City Council Member Abdi Warsame. Council Member Warsame stated that this news and the future opening of the Opportunity Center will fulfill one of his highest priorities. State Senator Kari Dzeidzic has also worked hard to advocate for resources for the Opportunity Center. Her efforts included $400,000 in funding for the Center in the tax bill that was not signed by the Governor for other reasons. Senator Dzeidzic is working to obtain other state funding sources to support the Center’s programs and operations. Hennepin County has contracted with EMERGE to manage and operate the Opportunity Center. EMERGE CEO Mike Wynne views the development of the Center as an historic milestone for Cedar Riverside. Minneapolis Community and Technical College (MCTC) will be another key anchor at the Center, and MCTC President Sharon Pierce also welcomed news of the Center moving forward. "MCTC shares a commitment with the Cedar Riverside Partnership to improving access to the transformative power of education," she stated. "We are pleased to be engaged with this partnership and excited that this new initiative will better connect Cedar Riverside youth with our pathways to career opportunities." A strong Core Team of community leaders has worked for more than 18 months to develop a program design that has strong neighborhood support. Amano Dube, Director at the Brian Coyle Center, has been deeply involved in crafting this vision. Engagement with both public and private employers at the Center is a key to the program design. Laura Beeth, System Director for Talent Acquisition at Fairview Health Services, has been a strong supporter for the Opportunity Center and hopes that it will enhance the pathways for Cedar Riverside residents to health care careers. The Star Tribune discusses fundraising for the Cedar Riverside Opportunity Center and what the Center means for the Cedar Riverside community. 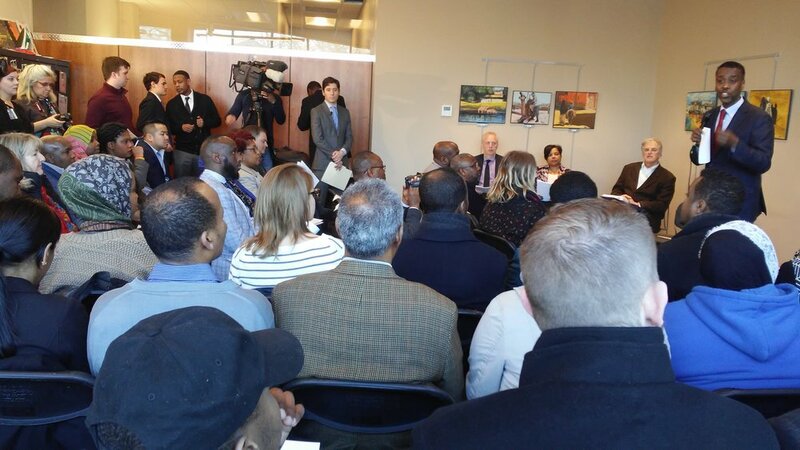 The Star Tribune discusses local initiatives in the Somali community and the lack of funding.